It reminds me that I serve a God that offers hope in a world that so often offers none. It reminds me that joy and peace are my birthright and the birthright of every believer. It reminds me that my life should overflow into the lives of others as I trust in God. It reminds me that I am dependent upon the Holy Spirit if I am to live a supernaturally empowered life. And it equips me with a powerful blessing that I can pray for others. Some of the biggest pain that we experience in this life is not caused by injury or accident or sickness – it is caused by people. The old adage, “Sticks and stones can break your bones but words will never hurt me” is just not true. Words hurt more and the pain lasts longer than a lot of physical pain. Evidently there were some things being said in the church in Rome that was creating hurt among its people. Yes, Christians hurt other Christians. Why do we do that to our bothers and sisters in Christ? 1) Because we are sinners and sinful people sin against others. 2) Because we ourselves are hurting – and hurting people hurt other people. 3) Because we are immature and immature people act childish. Look for ways to build others up instead of tearing them down (v. 2) – Our default mode is to return insult with insult. But we who have been transformed by Christ have the power within us to “turn the other cheek” and even respond with loving kindness. Look to and learn from the Word of God (v.4) – Mature believers are quick to run to the Scriptures instead of being quick to plot revenge and figuring out ways to get back at others when they have been hurt. 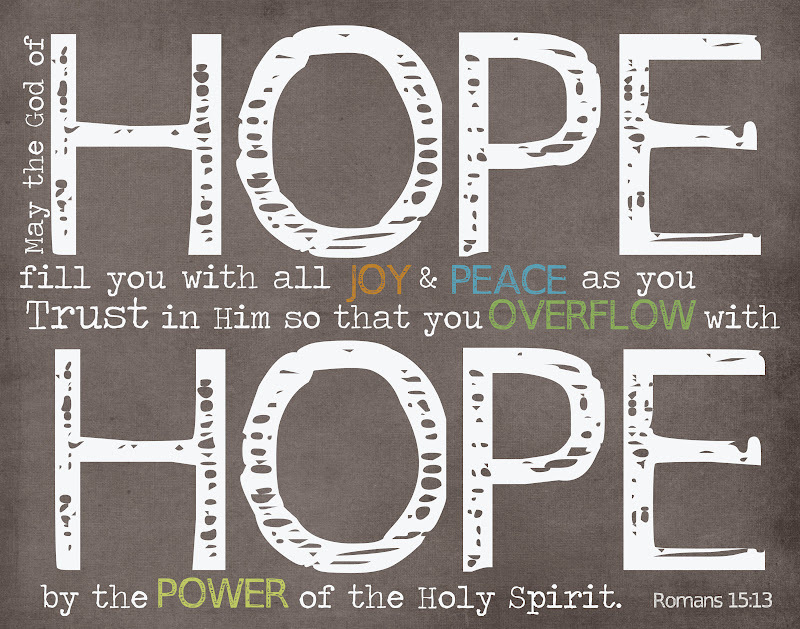 The Scriptures offer us help and they offer us hope. A couple of add-ons: 1) Make sure it is Christ that you are following and not the ways of the world or other people or your own selfish ways. 2) We have asked Jesus to come into our hearts – perhaps you might need to ask Jesus to come into your mouth if you are finding that you have not been responding to people well – that God might be glorified through you. This passage contains what is often referred to as “The Stumbling Block Principle.” The principle goes like this: There are things that some people consider to be “sinful” for themselves that God has not said is sinful. The believer who has liberty in this area should not do anything that would cause his fellow believer to stumble because of his own liberty. Let me give you a personal example. According to Scripture, drinking alcohol is allowed by God. There are not prohibitions against it. There are, however, prohibitions against drunkenness. So Scripture would say, for example, that if you want to enjoy a glass of wine you have freedom to do so – but don’t drink to the point of being drunk. More specifically, don’t drink to the point where the wine is in control and God’s Spirit is not. (See Ephesians 5:18). I think that I would enjoy wine. I think it would be romantic to sit down with my wife over a nice meal and enjoy a glass of wine together. But as a pastor I choose not to drink at all because in our southern baptist Christian culture, drinking has often been looked on as “sinful.” It would be a “stumbling block” to some believers if they knew that I drank any kind of alcohol. Therefore, i choose not to because I do not want to lead others in to sin because of my liberty. The old saying applies here – when you point 1 finger at someone else (in judgement), 3 are pointing right back at you. When we come to realize that we are going to be held accountable by God for our own actions, then we’ve got way too much to work on ourselves then to finger point at others. The problem is generally that we consider ourselves righteous in our own sight – we need to see ourselves, and then others, from God’s perspective. Then we will be much more hesitant to pass judgment on others. Nuf said!